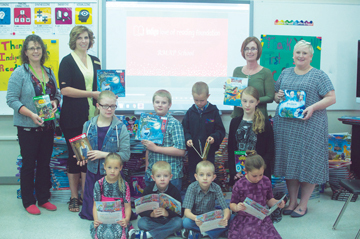 Photo by Justin Seward - On June 14, the RMAP School in Redcliff showcased the 1,500 books they received from the Indigo Love of Reading Foundation. The Redcliff Mennonite Alternative Program (RMAP) School students should not run out of literacy materials anytime soon after being the successful applicant in conjunction with the Redcliff Library of the Indigo Love of Reading grant of 1,500 books, which arrived in the community early last week and presented in the school on June 14. The Indigo Love of Reading Foundation has been about putting books into the hands of Canadian children and focuses on making reading materials available so all communities have the same access to quality literacy resources. RMAP Grade 1/2 teacher Cheryl Rebmann attended quarterly meetings as a literacy council board member for the Prairie Rose School Division (PRSD) to discuss literacy playbooks, which gives ideas to teachers for what they can improve upon for lesson plans in the classroom. Rebmann said literacy is important to RMAP and with the Redcliff Library as a division partner and with the literacy committee were able submit an extensive application for the grant which had students and their parents in a video talking a bout how what books mean to students in the classroom. “We did it as a community partnership because we don’t have a library for ourselves here that can hold so many books,” said Rebmann. When students attended the Redcliff Library, they were used to doing research with non-fiction books and now with piles of fiction books, it will allow them to explore their creative side with literacy. “A lot of our students don’t have as many opportunities to use their imagination with their background,” said RMAP principal Tracy Frank. PRSD superintendent Brian Andjelic said one thing he saw with the books is there were multiple copies and it will allow for the kids to read together and motivates them to read.